An abstract describing each study is included with a link to the original report or study. Contact information of the corresponding author is also included. 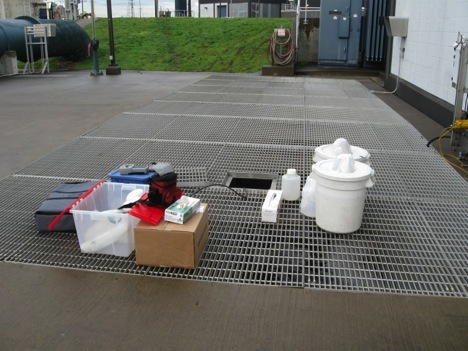 An investigation with the Center for Urban Waters at University of Washington Tacoma and Kitsap Public Health District evaluating the utility of a suite of CECs as tracers of bacterial contamination impacting the Puget Sound shoreline. Freshwater samples were collected at approximately 20 sites, incorporating a range of known and potential impacts. 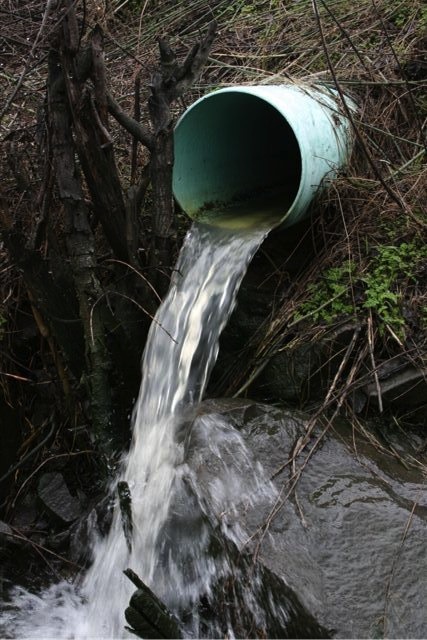 Samples were analyzed for a suite of over 20 CECs commonly associated with human wastewater, in addition to a suite of pesticides and other compounds. Final reporting will be in May 2014. The occurrence and fate of Contaminants of Emerging Concern (CECs) in the environment is a function of source strength, hydrodynamics, and susceptibility to environmental degradation. Puget Sound is an ideal location for the investigation of CECs due to the wide variety and magnitude of anthropogenic impacts on source strength. In this study, the spatial and temporal variability of a suite of CECs was investigated in samples collected in the estuarine waters of Puget Sound. The investigated CECs were comprised of approximately 20 pharmaceuticals (acetaminophen, ibuprofen), food ingredients (caffeine, sucralose), metabolites (paraxanthine, cotinine), and herbicides (atrazine, mecoprop). Spatial variability was investigated via a three-day, “snapshot” sampling event coordinated with citizen scientists in June of 2013 that encompassed sampling locations ranging from Padilla Bay in Anacortes to Budd Inlet in South Puget Sound. Temporal variability was investigated through repeated monitoring of the Thea Foss Waterway in Tacoma over approximately 6 months. Approximately 1 liter of water was collected at all sampling locations, filtered through 0.2 micron filters, adjusted to pH 8, extracted with solid phase extraction, and eluted with organic solvent. Final extract volumes were approximately 1.5 ml, (a concentration factor of approximately 1000). Extracts were analyzed with liquid chromatography-tandem mass spectrometry (triple quadrupole mass analyzers). 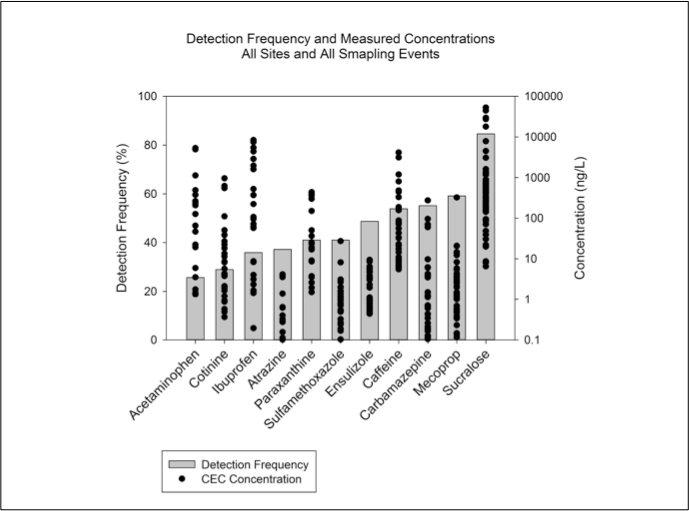 Method detection limits for most CECs investigated were below 5 ng/L (mass CEC per sample volume). Some of the CECs investigated were ubiquitous (Detection Frequency greater than 75%) in both the spatial and temporal variability sample sets, including caffeine, sucralose, mecoprop, and sulfamethoxazole. However, the measured CEC concentrations exhibited pronounced differences depending on the CEC, from mean concentrations of ~25 ng/L for sucralose to below 0.25 ng/L for mecoprop in the snapshot samples. In the snapshot samples, positive correlations (R2 greater than 0.6) were observed between carbamazepine and sulfamethoxazole, carbamazepine and sucralose, and theobromine and paraxanthine. These measurements of CECs represent some of the first of their kind in Puget Sound and demonstrate variability, or lack thereof, in CEC concentrations in space and time. This work was performed at the Center for Urban Waters at University of Washington Tacoma in conjunction with SoundCitizen, a citizen based environmental education program. The Washington State Department of Ecology and the U.S. EPA conducted a screening study to characterize pharmaceuticals and personal care products (PPCPs) in municipal wastewater treatment plants (WWTPs). Samples of influent, effluent, reclaimed water, and biosolids were analyzed from five WWTPs in the Pacific Northwest. The treatment technologies ranged from secondary processes such as activated sludge to advanced nutrient removal and tertiary filtration. Target analytes included PPCPs, hormones, steroids, semi-volatile organic chemicals, nutrients, and total suspended solids. Overall, the study results indicate that advanced nutrient reduction and tertiary filtration provide additional benefits for PPCP removal. The full report is available in the Washington Department of Ecology Report 10-03-004. A reconnaissance study was performed in the Columbia River Basin to assess CEC concentrations in wastewater-treatment-plant (WWTP) effluent and stormwater runoff. Nine cities were selected in Oregon and Washington to provide diversity in physical setting, climate characteristics, and population density—Wenatchee, Richland, Umatilla, The Dalles, Hood River, Portland, Vancouver, St. Helens, and Longview. Samples were collected from a WWTP in each city and analyzed for CECs and other anthropogenic organic compounds and metals. The stormwater-runoff samples did not include CECs. 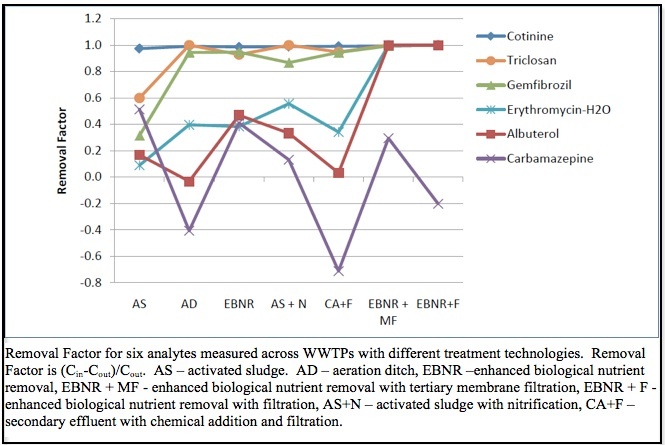 Of the 210 compounds analyzed in the WWTP-effluent samples, 112 (53 percent) were detected; the detection frequency for most compound classes was greater than 80 percent. Full details are available in the USGS Scientific Investigations Report 2012-5068. Effluent samples were collect from the 52 largest municipal wastewater treatment plants (WWTP) and water pollution control facilities (WPCF) in Oregon and analyzed for persistent organic pollutants, including many CECs. These facilities are located state wide and represent a variety of treatment processes, service population sizes, geographic areas, and flow conditions. Of the 406 chemicals ultimately analyzed, 114 were detected above the level of quantification (LOQ) in at least one sample. 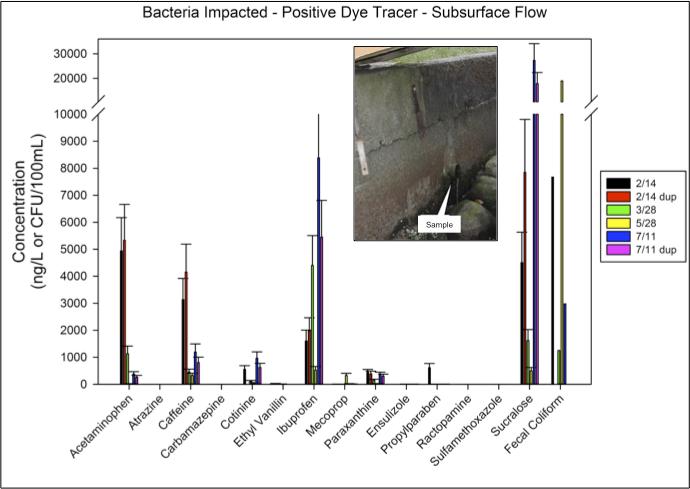 Few persistent pollutants were found possibly because of their diversion from effluent via sorption to sludge (solids phase) or high LOQs for certain chemicals. These results suggest that effluent, rather than just receiving waters, should itself be analyzed for a wide range of contaminants in order to understand how upstream sources, conveyed through WWTPs and WPCFs, could be impacting aquatic ecosystems. The results of the investigation have been published in Science and the Total Environment. Hope, B. K.; Pillsbury, L.; Boling, B., A state-wide survey in Oregon (USA) of trace metals and organic chemicals in municipal effluent. Science of the Total Environment 2012, 417, 263-272. Statewide Water Quality Toxics Monitoring Program, Oregon, USA. The Oregon Department of Environmental Quality’s laboratory is conducting a statewide survey to evaluate the occurrence and concentrations of toxic pollutants in Oregon’s aquatic ecosystems. Samples of water, fish, and sediment were collected around the state on a rotating basin cycle. Samples are analyzed for a variety of emerging and legacy pollutants including pharmaceuticals, pesticides, flame retardants, and combustion by-products. The laboratory completed its initial survey in 2013. The final data and report are expected to be released in Fall 2014. The results of this initial survey will be used to guide and inform the future, on-going monitoring strategy. Program details can be found at the Oregon Department of Environmental Quality Statewide Toxics Monitoring Program. The concentrations of 119 pharmaceuticals and personal care products (PPCPs) and 13 perfluoroalkyl substances (PFASs) are characterized in marine sediments collected throughout Puget Sound and Bellingham Bay. These data provide a comparison to previous measurements of these chemicals in influent, effluent, and biosolids from municipal wastewater treatment plants throughout the region. Concentrations ranged from very low to nondetectable for most compounds. Only 14 of the 119 PPCPs and 3 of 13 PFASs were quantifiable in sediments. Detected concentrations were often highest within the industrial harbor in Bellingham Bay and near the cities of Seattle and Bremerton. The full results of this investigation have been published in Environmental Toxicology and Chemistry. Long, E. R.; Dutch, M.; Weakland, S.; Chandramouli, B.; Benskin, J. P., Quantification of pharmaceuticals, personal care products, and perfluoroalkyl substances in the marine sediments of Puget Sound, Washington, USA. Environmental Toxicology and Chemistry 2013, 32 (8), 1701-1710. This work is being performed by the Washington State Department of Ecology Marine Sediment Monitoring Program. In June, 2013, sediments were collected at thirty randomly-selected stations in Elliott Bay using a probabilistic sampling design developed for the Washington State Department Puget Sound Ecosystem Monitoring Program. Sediments were tested for the presence of 119 pharmaceuticals and personal care products and 13 perfluoroalkyl substances. Analyses were conducted by AXYS Analytical Services Ltd., Sidney, BC, Canada, using AXYS Method MLA-075. This method uses liquid chromatography with tandem mass spectrometry (LC/MS/MS). 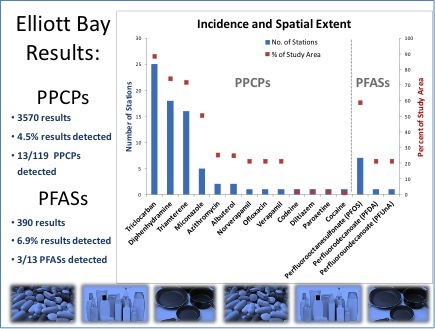 The results of this investigation were summarized and presented graphically to indicate the concentration and distribution of PPCPs and PFASs in Elliott Bay sediments, with comparisons made to concentrations measured in sediments from Bellingham Bay and at ten long-term monitoring stations around Puget Sound. They were presented in April 2014 at the 2014 Salish Sea Ecosystem Conference and at the 2014 Pacific Northwest Society of Environmental Toxicology and Chemistry chapter meeting. They are not yet published. Program details can be found at the Washington Ecology Marine Sediment Monitoring Program website. Marine waters near urban centers receive frequent inputs of chemicals that are emerging as threats to ecological and human health referred to as chemicals of emerging concern (CECs). Priority lists of CECs include some endocrine disrupting chemicals (EDCs) such as natural and synthetic estrogens; 17β-estradiol (E2), estrone (E1), estriol (E3), and 17α-ethynylestradiol (EE2), as well as the industrial phenolic compounds [e.g., bisphenol A (BPA), octylphenol (OP) and nonyphenol (NP)]. Recent information on the levels of these EDCs in water indicates that they may pose a risk due to their widespread occurrence and their potential estrogenicity, affecting growth, development and reproduction of marine fish. Although limited data are available on exposure concentrations of EDCs in biota of marine ecosystems, recent studies in Puget Sound have reported measurable levels of selected EDCs in bile of male English sole that are correlated with abnormal reproductive cycles and elevation in plasma vitellogenin levels in this benthic species. To determine the baseline levels of these chemicals in marine fish and increase our knowledge of EDC exposure in Puget Sound, we applied a recently developed method for quantitative analysis of a larger suite of EDCs (i.e., E1, E2, E3, EE2, BPA, OP, NP) in bile of male and female English sole collected at 10 different sites, including urban, near-urban and non-urban sites. Concentrations of EE2, OP and NP were below the limit of quantitation (1.5, 15 and 15ng/mL of bile, respectively) in fish bile whereas BPA was detected in most samples collected throughout Puget Sound. Higher mean levels of the natural hormones E1, E2, E3 were found in bile from both male and female sole collected in the urban and near-urban sites. Determining the ranges of biliary concentrations of these EDCs in marine fish from Puget Sound will provide information on environmentally-relevant concentrations for follow-up laboratory exposure studies and is a critical first-step in defining thresholds of concerns for these CECs in marine fish. This work is being performed by the Environmental Chemistry Center at the NOAA NW Fisheries Science Center. Results of an associated study have been published in Chemosphere. da Silva, D. A. M.; Buzitis, J.; Reichert, W. L.; West, J. E.; O'Neill, S. M.; Johnson, L. L.; Collier, T. K.; Ylitalo, G. M., Endocrine disrupting chemicals in fish bile: A rapid method of analysis using English sole (Parophrys vetulus) from Puget Sound, WA, USA. Chemosphere 2013, 92 (11), 1550-1556. Synthetic polybrominated diphenyl ethers (PBDEs) have been widely used as flame retardants in many consumer products including electronic devices. The most important routes of human exposure appear to be from contaminated food and contact with dust found in households and workplaces. Structurally related derivatives of PBDEs are the hydroxylated (OH-PBDEs) and methoxylated forms (MeO-PBDEs). Experimental evidence suggests the OH-PBDEs pose greater health risks than other forms of PBDEs. Certain OH-PBDEs and MeO-PBDEs are also marine natural products and it is unclear although likely, that marine fish and shellfish, which bioaccumulate these compounds serve as a vector for human exposures. In this study, we are measuring a variety of PBDE, OH-PBDEs, MeOPBDEs and non-PBDE flame retardants in household / workplace dust and blood plasma samples provided by volunteers living in the Puget Sound region of Washington State, working in either the commercial fishing or recycling industries. The commercial fishing occupation is largely an outdoor activity that promotes above average seafood consumption while electronic recycling may expose workers to dust with higher than average levels of PBDEs. 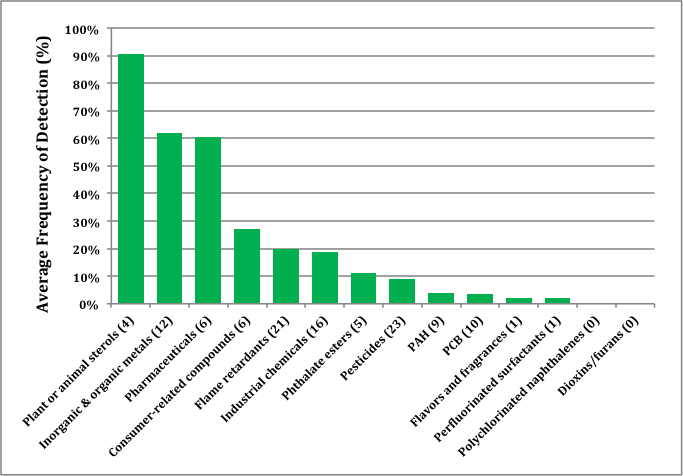 Thus, comparison of PBDE levels in samples associated with these occupations may provide insight on the relative importance of dust vs. food as a source of PBDEs. This work is being performed as a collaboration between the Battelle Marine Sciences Laboratory, Department of Civil and Environmental Engineering at Virginia Tech, and International Consortium for the Environmental Implications of Nanotechnology. There are increasing concerns over environmental impacts of pharmaceuticals released into surface waters from municipal wastewater treatment. These concerns motivated the present study, where we initially monitored four different streams in the greater Puget Sound region for the occurrence of estrogenic contaminants and select pharmaceuticals. This initial survey identified one site near a sewage treatment outfall (White River, WA) where estrogens (E2 and E1) were occasionally observed while two SSRIs, fluoxetine and sertraline were always observed in both grab samples of river water and passive sampling devices deployed for several weeks at the site. In some samples, the concentration of the SSRIs exceeded 30 ng/L. This surprising finding prompted us to do additional experiments to better understand the toxicokinetics and disposition of SSRIs in fish and assess whether exposure to either fluoxetine or sertraline impacted fish reproduction. During our initial survey season, we placed caged, sexually mature rainbow trout at each site for up to eight weeks and then subsequently spawned them to assess fertility. The only site where we observed poor fertility was at the White River site. Subsequent laboratory studies use fathead minnows exposed to water collected from the White River site (near a sewage outfall) and controlled exposures to sertraline. Toxicokinetic studies of fluoxetine in trout provided interesting results in that plasma concentrations were nearly undetectable during three week exposures to 1 ug/L, yet brain levels were relatively high as were concentrations in the liver and kidney. These latter findings would be consistent with active sequestration of SSRIs in these tissues. Our collective findings indicate that fish can rapidly absorb SSRIs and concentrate them in target tissues such as the brain causing neuroendocrine changes that are associated with decreased reproduction. This work is being performed at the Battelle Marine Sciences Laboratory and the University of Idaho, Department of Biological Sciences.